How many times do you pet your dog? How many times do you pet your dog outside? During a walk? In the dog park? We don’t think about it much, but most of us tend to pet our dogs only in certain contexts: when we come home from work, when we’re on the couch, or when we’re in our beds. Rarely do I see people taking a few seconds to get low to the ground and pet their dogs outdoors. This baffles me, especially since petting doesn’t cost us anything but a little bit of time. I understand that we live in a fast-paced world, but taking 5 seconds to pet your dog a few times a day is going to save you plenty of time in the future. Recent research has shown that praising and gazing into your dog’s eyes for a couple of minutes will release oxytocin (the “feel-good hormone”) in both the dog and the handler. However, many dog handlers fail to spend the time to connect with their dogs in this way in different settings or contexts. Let’s change that! Your dog might be used to only getting your attention at home, or only getting treats outside, so start by making petting a positive association. 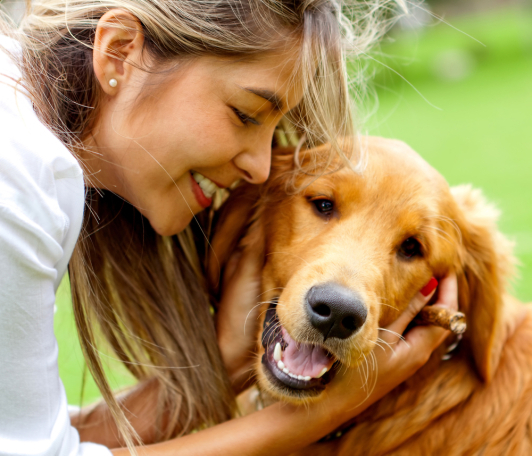 First, find out your dog’s preference in petting by running a quick experiment at home: Simply try the following five ways to pet your dog and see what gets the best response. Scratch at the base of the tail. Stroke your hand along the dog’s side, from shoulder to hip. If dogs don’t get the proper amount of sleep, both their physical and emotional wellbeing suffer. Good, high quality sleep allows your dog’s brain to restore and rejuvenate itself along with the rest of the body. Even if you think all your dog does all day is sleep, you need to consider the quality of that sleep. In order for the brain to recharge, the body should be reaching deep, uninterrupted sleep. If your dog’s sleep is constantly interrupted by household noises, he probably isn’t getting the deep sleep he needs. If your dog is anxious when left alone in the house, she might not be getting proper sleep when you are away, due to the sounds in and around your home or her worry about your absence. Remember, sleeping while being vigilant is not restorative. Allowing your dog to remove himself from activity to take a nap is a great way to prevent problems, reset the dog’s internal balance, and helps combat many anxieties. A crate is the best place for a dog to nap. It allows the dog to truly rest without worrying whether you are going to another room, and it keeps the dog safe from children, people, or scary hallway noises. Dogs should have daily naps, even when you’re home, as your presence will allow for a deeper sleep. Adequate and appropriate exercise and play time are both critical parts of preventing behavioral problems and having a well balanced dog. Exercise should be vigorous enough to elevate your dog’s heart rate, which for healthy, able-bodied dogs means more than a stroll. While limited daycare and dog parks are an option for exercise, there should also be plenty of exercise that involves interaction with a human (you), such as fetching, running, tugging, agility, and so on. In fact, if you really want a strong relationship with your dog, roughly 80 to 90 percent of the dog’s play time should be with you, not with other dogs. When we live in places with limited places to exercise our dogs, we tend to “outsource” play to daycare, dog parks, or the yard (letting dogs bark and chase squirrels in the yard to tire them out). However, while these resources can be convenient, they can also lower your value for your dog. Your dog will see these areas as more exciting and rewarding than you. This will show up as pulling to pull to get to the park (or to daycare, or to other dogs), and/or being unwilling to come when called at the park (see my blog on dog parks ). Playing with your dog allows for a more structured form of physical stimulation and increases the value of your relationship. Play is a self-rewarding activity for your dog, which makes it a great way to build a relationship independently of treats. If you have a dog who is not used to playing with you, here are some suggestions to help increase their play drive with you. Did you know your dog has a second “brain”? Well, it does, and it’s located in the stomach. The gut’s brain, also known as the Enteric Nervous System (ENS), is composed of 100 million neurons–more neurons than the spinal cord but fewer than the brain (which has 100 billion). The ENS sends signals to the brain that directly affect mood, stress levels, memory, learning, and decision making. This helps explain the mechanics of changing mood through diet. While improving a dog’s diet alone is unlikely to cure her from her emotional imbalances, it may contribute to overall behavior modification success. Achieving emotional balance and reducing stress is about being healthy in mind and body. A dog’s mind and body are linked together, just as in humans, and certain types of food that can make your dog feel calmer and less stressed. There are great books out there about canine nutrition. It’s an important topic that is often overlooked when it comes to understanding our dog’s behavior. Every dog is unique. Contact your local canine nutritionist or a vet who is not sponsored by a major dog-food company about the best diet for your dog. This is a big one! As I wrote in a previous post, having a calm, clear mind when working with your dog is an essential—and often overlooked—aspect of successful training. This is especially important when you have a sensitive dog who either gets nervous or aggressive around stimuli. Dogs can sense our energy, and sometimes that can be the factor that determines our dogs’ ability to listen to us. If you’re angry, upset, or frustrated, your dog reads your body language and quickly learns to avoid you when you’re angry. Your tension can also add more stress to your dog, which can increase hyperactivity, anxiety, or aggression. Let’s face it, no one wants to be around someone who is always crabby or has unpredictable mood swings. If your dog is constantly running away from you, running away from home, not coming when you call, and so on, take a second to think about what you might be doing to cause that. Are you yelling at your dog? Are you upset as you call your dog? Do you scold your dog when he does come back to your side? Listen to what your dog is telling you: your attitude isn’t much fun right now.